This Concert Marimba from Adams Percussion is selected by professional soloist to school program use and is one of Adams' best sellers. A perfect sound balance and tuning throughout the entire range of the instrument is achieved by the very skilled hands of craftsman being aided by Adam's specially designed computer system. The resonators produce clear fundamental note amplification and maximum vibration free sustain through a process of welding and power-coating. In order to play under all temperature and moisture conditions, the resonators can be set in two positions due to the rubber mounting blocks mounted on the side panel. 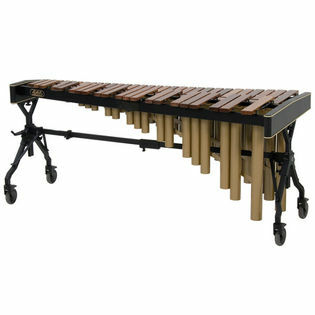 Drop Cover and Mallets included.